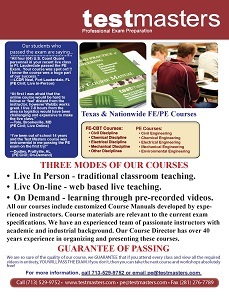 Enroll in the Testmasters PE Environmental Online Course for only $599! Please Note:The video above is being streamed through YouTube in order to demonstrate sample course content. The actual Testmasters online course video player requires Adobe Flash 10.0. Our courses stream in high definition video and adapt to your internet connection speed: the faster your connection, the better the video quality. If you experience a low quality video, your internet connection may currently not have sufficient bandwidth. To check your video quality, please watch the Testmasters sample video within the Testmasters video player. Unique and Highly Effective Approach Not Taught Anywhere Else! All course materials are included in course fee. Extended Preparation: Watch Classes for Up To Four Months (120 days). Flexible – Watch Classes Multiple Times and Anytime You Want! High Quality – Classes Stream in High Definition Video. Convenient – Watch Classes from Home. Mobile – Watch Classes through your Smartphone or Tablet via the Testmasters Apps.